Once restored, an implant looks and functions like a natural tooth. It fits securely even when you chew and speak. A single tooth implant does not involve treatment to your other teeth. Although nothing can truly replace a natural tooth, the modern dental implant is the next best option. Normal chewing function can be established. Patients with dental implants report they can chew well and do not notice a significant difference. An implant looks and functions like a natural tooth. Once in place and restored, the implant stays in place and does not come out of your mouth. A single tooth implant does not involve treatment to your other teeth. Can replace one tooth, several teeth, or an entire mouth. Can support a single crown or a bridge (multiple teeth). Can hold in a partial denture or complete denture and significantly improve chewing function. Will not develop decay (i.e. a cavity). Better esthetics than a partial or complete dentures. May last longer than a traditional bridge placed on natural teeth to replace a missing tooth/teeth. Surgical placement of an implant causes less post-treatment discomfort than removing a tooth. Some patients may be able to return to work after the treatment. **Intravenous Sedation is available in our office for those patients who desire to be sedated. Patients who choose Intravenous Sedation report an excellent dental experience and do not remember the procedure. Sometimes the implant and the crown (i.e. tooth) can be placed at the same time and you leave the office with a tooth. Sometimes the implant treatment is done in steps which allow your body to heal before the next step is done. Although this may take a few months to finish the treatment, the advantage for you is that this breaks up the cost over a period of time instead of having to pay for it all at once. Most people are candidates for dental implants. No one is too old. I've seen implants placed in a ninety year old man so he could enjoy quality of life. On his 95th birthday he celebrated that his dentist was the only one who believed he would make it another five years! Come in to our office for a consultation and let us show you what can be done for you. Many implant options are available. 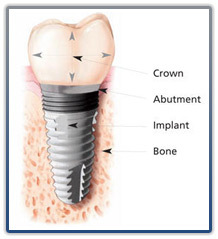 Replacement of a tooth with an implant costs about the same as a traditional bridge. Insurance coverage for implants varies widely among insurance companies. Our office can help you determine if your policy has coverage for you. Free Implant Consultation if you mention that you saw this on our website.